Wildland firefighters from the Seminole Tribe’s team were in high demand out west this summer. It was a rough fire season and seven were deployed around the country. According to the National Interagency Fire Center, 46,228 fires have burned 6,990,889 acres nationwide between Jan. 1 and Sept. 6. As of early September, 97 wildfires were still burning on 1.9 million acres in 12 states. Fighting fires in other areas of the country is nothing new to the Tribe’s forestry department. It has been sending firefighters across the U.S. since 2011. This year they fought fires in Idaho, Nevada, Oregon, Texas and Washington. 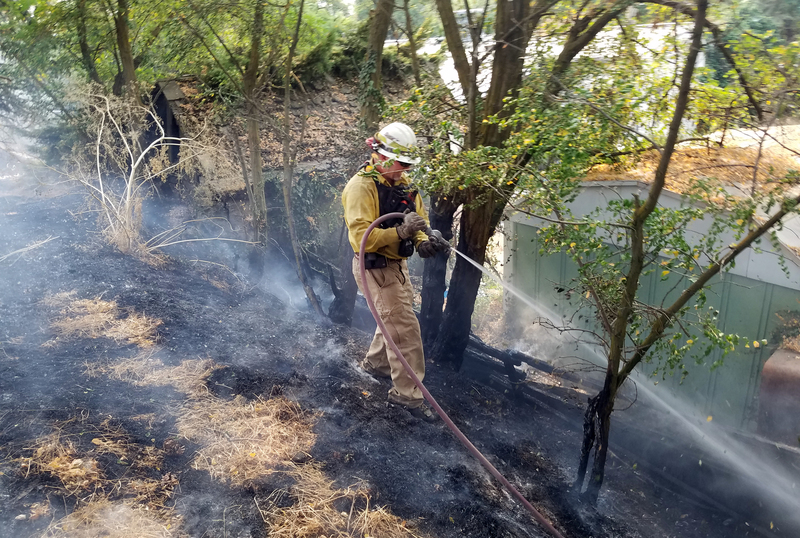 “When our firefighters come back they are more comfortable with extreme fire behaviors,” said Grant Steelman, fire management officer/forester. “The biggest thing we get is on the job training. The deployments allow the Tribe’s wildland firefighters to function more efficiently and safely to protect tribal structures and infrastructure, while keeping their qualifications current through the Incident Qualification Command System used by all wildland firefighters. Those qualifications cannot be maintained through books and classrooms; they must be maintained on wildfire assignments. Operations Supervisor Michael Lightsey began his career in 1988 with the Florida Forest Service and has worked with the Tribe for 11 years. He spent three weeks of the summer fighting fires with the Bureau of Indian Affairs on the Umatilla reservation in eastern Oregon. Lightsey was there to support the reservation where needed and he responded to about six fires on and just off the reservation. The topography of the area is hilly and also has some steep terrain. The mountainous areas have a lot of timber, which was difficult to extinguish since trees burn longer than the grasses in the lower elevations. Due to the steep terrain, engines couldn’t get close to the fires so a lot of the firefighting work was done on foot. Working in teams, one firefighter carried a bladder bag (five gallon backpack filled with water) and the other had hand tools. Aviation was another tool used to fight the Oregon fires, including heavy air tankers, helicopters and single engine air tankers such as crop dusters. The grasses and wheat were about three feet high, unless it had been harvested. If so, the stubble was put into bales of straw. Lightsey saw a fire of 2,500 bales that burned for weeks; all they could do was contain it. 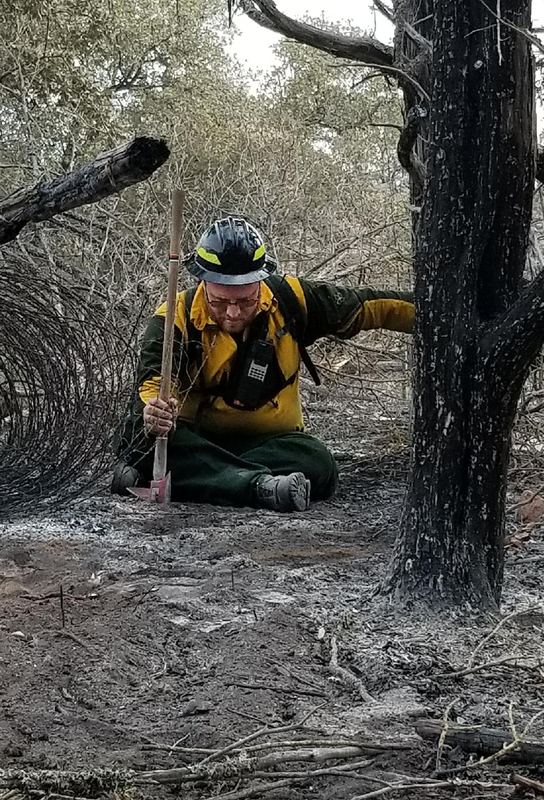 Assistant Fire Management Officer Chris Kemp also began his career with the Florida Forest Service about 20 years ago and has worked with the Tribe for the last six years. He was deployed to the Umatilla reservation in Oregon twice this summer; once for 18 days in late July and again for eight days from late August to early September. He also worked mainly on foot because of the difficult terrain. In the valley, local farmers used their tractors and farm equipment to assist the firefighters and kept the fires from growing too large. Local fire departments also helped by bringing water. But the mountainous areas proved to be the most challenging for Kemp and his team. 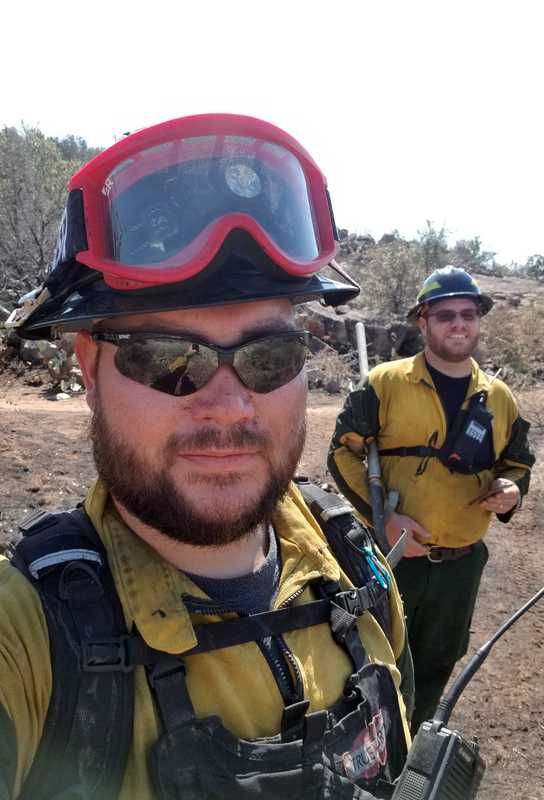 Wildland firefighter Nate Cournoyer and fuel specialist Jeff Radakovic were deployed to Texas for three weeks in July and August, where they worked on three different fires in the central area of the state. Together they provided additional attack support for the fires with engines from Big Cypress. They worked with teams from the BIA and other agencies. Texas presents a host of commercial dangers, including gas lines underground and above ground, oil, low-hanging power lines. At every fire, the volunteer firefighters were the first on the scene for the initial attack. The volunteer firefighters Cournoyer worked with were all qualified for structure and wildfires; some were also emergency medical technicians and paramedics. The difference between fighting fires on the flat land in Florida and the varied terrain out west was vast and impacted the firefighters experience levels. Some of their commanders have come to the Seminole reservations and helped on prescribed burns to get more experience; Kemp worked with one who was in Big Cypress in January. “He took that training and put it to work with his team,” he said. Travel also exposed the Seminole firefighters to other cultures and situations. Sending STOF wildland firefighters out west appears to be a win-win for all involved. 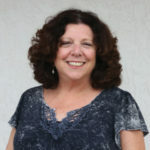 Steelman summed up the value to the Tribe by helping other areas of the country deal with wildfires.